Arizona Milk Snake: Also known as the Arizona Mountain Kingsnake, it may sound like a drink but the Ari-zona milk snake is very well adapted to live in a number of habitats across the state, rang-ing from streams and springs or areas of freshwater, to wooded areas and conifer forests, preferring to feed on baby / nesting birds, rodents such as mice and rats, and lizards. A snake native to the state, you will occasionally find this snake during the daytime hours in vegetation, or among rock and log piles. Arizona Patch-Nosed Snake: A subspecies of the patch-nosed snake, or western patch-nosed snake, the Arizona patch-nosed snake are relatively small in size, usually growing to a maximum of 45 inches in length. Although a number of color and patterns are noted, it tends to be a yellowing / tan color with steps of a darker, almost-black pattern running throughout the length. Feeding on creatures such as rats and mice, lizards, reptile eggs and even other snakes, this one is more often found in dry deserts and won’t cause too much of a problem in res-idential areas. 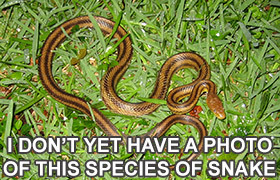 Banded Leafnose Snake: You’ll spot the banded leafnose snake along with the Saddled Leafnose Snake and the Spotted Leafnose Snake in Arizona, usually a very light colored reptile with darker brown, tan and grey bands. 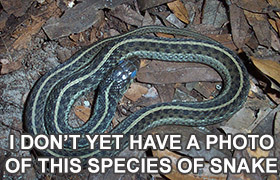 With a stubbier nose than most other snakes, earning it the leafless name, it is often spotted in sandy areas where you’ll probably miss it because it will be well camouflaged. Blind Snake: You’ll be forgiven for thinking the blind snake, also known as the western threadsnake, western blind snake, or slender blind snake, was an earthworm as that is pretty much what it looks like - small, slender and a brown, earthy color. It lives mostly underground meaning that you probably won’t encounter this species, and as the name suggests, they have eyes but they are basically useless. You can’t see much underground. 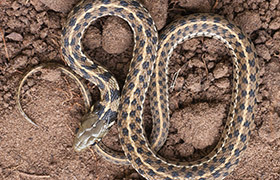 Checkered Garter Snake: A subspecies of the garter snake, the checkered garter snake is another of the very small common snakes of Arizona, only growing to between 30-42 inches and in many cases, not even that long. 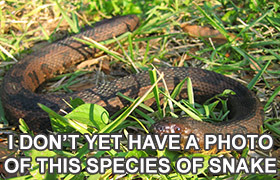 Usually eating earthworms, toads, frogs and even small fish, you’ll likely spot this snake along watery streams, lakes and ponds, and you may even come across one in the back yard after a good rain when all the worms are rising to the surface. Coachwhip (Red Racer): A snake that seems to be common in many states across the USA, the red racer or coachwhip snake is another thin but medium-sized species, usually growing to around 50-70 inches in length. Very fast-moving snakes, you probably wont’ need to worry about the coachwhip. It’s a ‘bolter’ which means it’ll be long gone before you’ve even had a chance to spot it. 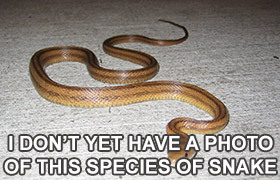 It’s a great hunter and is well adapted to chasing after speedy lizards, so slithering away from you won’t be a problem. Common Kingsnake: Both the common kingsnake and the Desert Kingsnake can be found in Arizona, brightly colored snakes that are often confused for the venomous coral snake. The good news is that the kingsnakes you’ll come across ARE NOT venomous although may bite if cor-nered. Western Hognose Snake: Another snake common across many states of the USA, the hognose snake looks very much like a rattlesnake but neither has a rattle, or venomous fangs so there’s nothing to worry about. Patterns and colors will vary massively although males are generally smaller and more slender than their female counterparts, and as a whole, will be a docile reptile that will only bite when aggressively handled. There are a reported thirteen different species of rattlesnake found in Arizona, the toxicity of the venom among these snakes will vary from species to species. 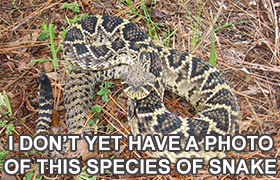 The species that seems to be responsible for the most human snake bites in the USA is the Diamondback Rattlesnake, a very common snake. The rattlesnake bite is said to be one of the most painful of any snake bites and when looking at the venomous snakes of Arizona, the Mojave Rattlesnake is definitely one to avoid, a snake with the most toxic venom that is harmful to human life. Death is rare but can happen without appropriate medical treatment. The Coral Snake is another dangerous and venomous snake to watch out for in Arizona but this species is both secretive and small in build, making it an unlikely one for you to encounter. 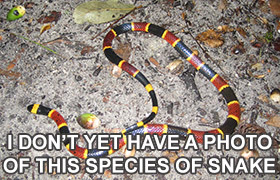 Although venomous, the coral snake actually injects very little of its venom in-to its prey meaning that a bite is unlikely to kill an adult human. 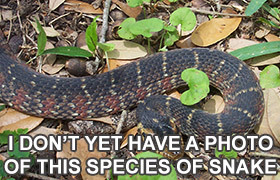 For more information, go to my Snake Removal - How to Get Rid of Snakes home page.